ABSTRACT: An alternative bleaching method to process highly oxidized palynofacies, characterized by undeterminable dark-hued palynomorphs is described. This procedure has been found useful in obtaining palynomorphs sufficiently translucent for transmitted light microscopic examination. It is performed after the main standard stages of palynological processing procedures and is based on controlled lengthy bleaching by sodium hypochlorite (NaOCl, common household bleach). This method promotes the use of a mild medium which is less dangerous than the oxidants commonly used for bleaching. It is a safemethod for both laboratory operators and the environment since it can be performed out of a fume cupboard using low concentrations of NaOCl solution. Compared to other bleachingmethods, it is inexpensive, simple, relatively quick and adaptable. 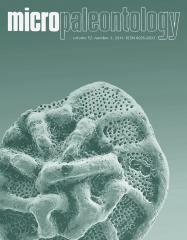 The goal of this study is to improve the value of palynomorphs as relative age indices in continental-paralic successions, typically characterized by strongly oxidized palynofacies and frequently barren of other fossils.